Nnu Income Program (NIP) review is it scam or Legit? N.I.P in full means NNU Income Program, an initiative conjoined with Nigeria New Update platform, nnu.ng. NIP is a program with a mission of dealing with general financial problems in Nigeria among the Nigerian youths, students, middle class and whoever that wish to take advantage of this earning opportunity and making money online legitimately as it creates the platform for the participant to earn passive income on a monthly basis. Over the year we have seen many platform's that acted so serious but end up bringing most people's thought down and so.many might have know about Affnaija but first do you know this platform NNU is own by a reputable online marketer in Nigeria? Are the Earnings Online Real? Yes sure With the NARS, active participant earns residual income by login in to their NNU account daily, reading news, comment, and even share assigned sponsored post on their social media. They share theier ads revenue with you monthly when you make NNU community your news and information household / info hub. Will NNU Run away with my Money? 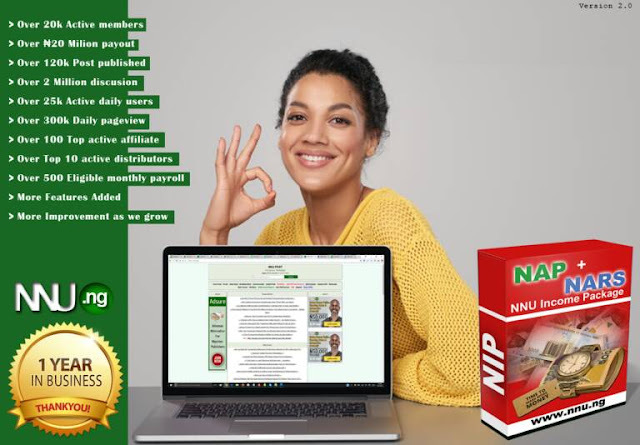 NNU Income Program (NIP) this is a financial, solution program not a quick rich scheme and it’s also a Double Your Hustle (DYH) idea created July, 2017 by a young Nigerian netpreneur Paul Samson under the auspices of G - Cyber Technologies. A professional web and ICT business registered under Corporate Affairs Commission (2453653). N1,600 Naira only (one time payment). Your application will only get approved when you have successfully purchase and pay for this package. So make sure you have your N1,600 Naira ready before you proceed to the registration. Get Paid To My Bank Account is it Real? Just make sure you have provided your bank account details in your profile and start earning until you reach threshold. Minimum payout is N5,000 naira threshold. In most cases, affiliates / referral earners and top earners get paid first until available monthly revenue is finally exhausted. If you did not get paid while you have earned N5,000 threshold, it doesn’t mean you wont get paid while the system keep running. You only need to earn more and remain for you to have a share on the following month revenue payout.